This article takes you through the steps of setting up your DSLR camera to record videos and photos and to get them to appear in your RightBooth events (via the digicamControl app). Where required we will make reference to the Canon EOS 80D and the Nikon D7100. is using a large capacity SD card. Something like 64Gb or 128Gb would be ideal, especially if you are going to be recording videos. is configured to not power off after periods of inactivity. is configured to record either MP4 or MOV video files. RightBooth can accept both video file formats. In the example image below, the Nikon D7100 has been set to record MOV files at 1920x1080x30fps. is configured to capture JPG photos. Most DSLR cameras can capture photos in RAW format and/or JPG format, but RightBooth can only process JPG format files. In the example image below, the Canon 80D has been set to capture high quality 6000x4000 JPG files and to not ​capture RAW files. 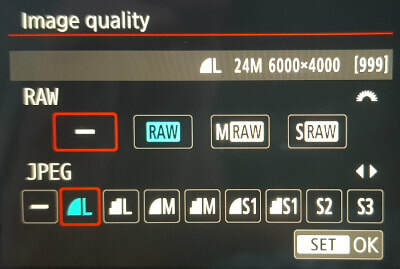 You should also manually configure your camera with the appropriate exposure, aperture and ISO settings. Turn the camera on and connect it to a fast USB port (USB 2 or 3) on your computer. 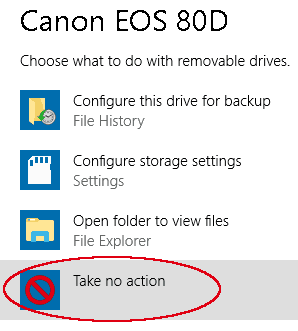 The first time the camera is attached to your computer you will be prompted to decide what will happen when the camera is connected. Ensure your computer is connected to the computer and is switched on. Click the option: Start digicamControl with RightBooth (2). This will start the digicamControl app that is used to send commands and files between RightBooth and your camera. Note: You may need to restart RightBooth for this setting to take effect. Make sure the Temporary folder (5) references a folder on your computer that has full access rights for creating and writing files. This folder will be used by digicamControl as a holding area for photo and video files that are transferred from the camera to the computer. In our example we are using the folder C:\dcctemp. Use the Photo test and Video test buttons (6) to check that RightBooth can capture files from your camera. Note: If your temporary folder is not set up correctly you will receive a warning message. If everything is set up correctly. RightBooth will then be able to capture photos and videos from your DSLR camera and you will be able to use the camera when playing events. Each time you start RightBooth, the digicamControl application will also be started at the same time and it will then appear minimised on the Windows Task bar (see image). On some systems this process can take a while and you will therefore need to wait until the digiCamControl icon appears on the Taskbar before RightBooth can capture photos and videos from your camera. Note this option only applies to photo files. Video files will continue to be recorded to the SD card before being copied to the PC. After each photo or video is captured by your camera, there will be a delay while the file is transferred to the computer (via the USB cable). When RightBooth is playing an event it will display the Busy screen during the file transfer process. connecting the camera to a high speed USB port on your computer. If you find that the transferred videos and files are not appearing in RightBooth it may be because the transfer wait time needs increasing. You can increase the transfer wait time for photos and videos in RightBooth Settings --> DSLR (see screenshot above).